The Columbus Catfish got the best of both worlds Friday night in Savannah. A pair of games were in doubt from even being played. But they waited out the weather, then took two from the host Savannah Sand Gnats (Mets), 5-3 and 5-2. The first game was all Catfish, as they jumped out to an early lead, then held on for the win. The nightcap was a pitchers' duel, with the Catfish finally solving Savannah pitching in the last two innings. And between it all, fireworks and a performance that was special ... at least to me. In the first game, the Catfish jumped out to a 3-0 lead. Following a rain delay of nearly 90 minutes, the game got underway, and the Catfish were underway. With 1 out, DH Shawn Williams singled, then went to second on a passed ball. With 2 outs, 3B Greg Sexton single, putting runners on the corners. What should have been an RBI single turned into a bases clearing round-tripper, thanks to an error by Savannah CF Richard Pena. The ball bounced in front of him, then rolled all the way to the wall, allowing 3 runs to score, including the batter, Catfish RF Quinn Stewart. When things finally settled down, the Catfish were up 3-0. Savannah scored in the bottom of the 1st, making it 3-1. But in the 2nd, LF Reid Fronk drove in C Ian Paxton with a sacrifice fly to left. Savannah closed the gap to 4-2 with a run in the bottom of the 4th, but the Catfish responded in the 5th. Fronk tripled with 1 out, then scored when a grounder by Sexton bounced off Savannah 3B Nicholas Giarraputo's glove. It was ruled an error, but was a difficult play. Regardless, Fronk scored and the Catfish had a 5-2 lead. A Savannah run in the bottom of the 5th closed it to 5-3, but that was it for the scoring, and the Catfish had their 7th straight win. Fireworks were held between the games because of the lateness of the hour. And there was a special singing of the National Anthem -- more on that later -- before game two. In the 2nd game, Savannah scored an unearned run in the 3rd, then another run in the 4th, to take a 2-0 lead. But in the 6th, the Catfish finally got on the board. Quinn Stewart hit a 2-run shot over the right field wall, tying the game. In the 7th, the second set of fireworks got underway. C Mike McCormick struck out, but reached on a 3rd strike wild pitch. 3B Seth Dhaenens moved McCormick into scoring position on a sacrifice bunt. 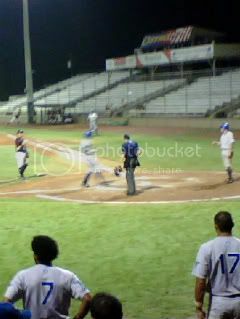 2B Omar Luna singled, putting runners on the corners. Following a pitching change, the Catfish tried a suicide squeeze. Home plate umpire Jacob Danielson ruled McCormick out on a tag at the plate, much to Catfish skipper Matt Quatraro's displeasure. Did I say displeasure? I meant extreme displeasure. Loud, vocal, extreme displeasure. With adult words and everything. But, apparently not enough to get tossed. Anyway, with 2 outs and runners on first and second, it looked liked the Catfish had blown their best opportunity. That's when SS Shawn O'Malley doubled down the left field line, scoring Luna, and giving the Catfish a 3-2 lead. Fronk followed with a 2-run single to right, but was thrown out trying to stretch it to a double. Regardless, the Catfish had a 5-2 lead. Reliever Austin Hinkle closed out the 7th, picking up a save, his 11th. Jeremy Hall picked up the win, his 8th. O'Malley and Stewart were the only Catfish batters with more than 1 hit off the Savannah staff in game two. In the first game, Williams, Stewart, and Paxton each had 2 hits. Josh Johnson picked up the win in relief. The Catfish have now won 8 straight, and are looking for their 2nd straight sweep Saturday night against Savannah.